To ninety-nine percent of the world, traveling though the Canadian Rockies is considered an exotic dream of a life time and the few who consider doing it on a bike it would be the ultimate ride. The 1 percent of us who do it on a regular basis, are often in too big a hurry to notice the beauty. Last week, I decided to take an extra day, slow down and enjoy the trip. I headed north from Kamloops on the Yellow Head Highway, stopping at antique stores in Barrier and Old Fort, then a stop at the UFO ice cream strand, where the secrets of the UFO sightings were reviled to me before I pressed on. Blue River is not the end of the world but at times it can feel that way. 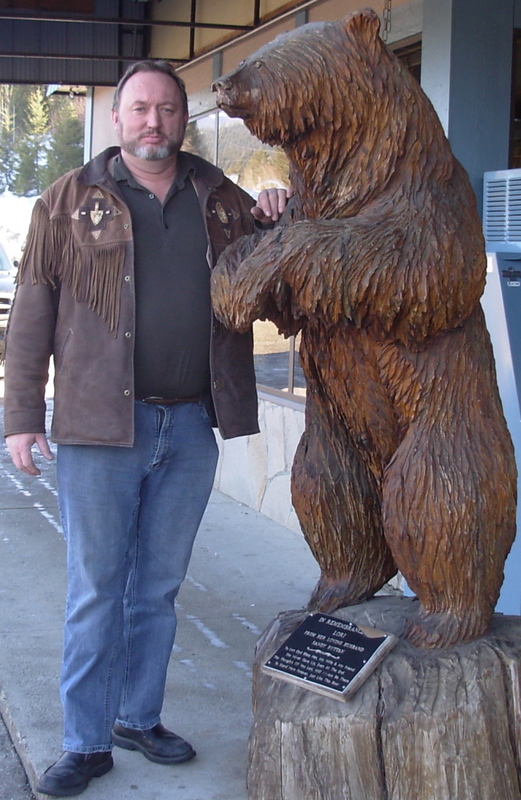 I was riding alone on a quiet stretch of highway winding between the mountain cliffs on ones side and the beautiful North Thompson River on the other, when I noticed a large brown bear ahead of me standing on the white line and looking straight at me. I geared down and began slowing waiting for the bear to head for the trees as they usually do but he stood his ground. I thought perhaps I could get onto the shoulder and gun by him but he would be close and if he bolted for the wrong ditch… well a collision with a bear is not be a good thing. I geared down again and thought this would be a good time to have loud pipes as my stock mufflers barked slightly but not enough to move the bear. We now had our eyes locked and I rolled to a stop about sixty feet away. I was sure I could spin the bike and accelerated before he reached me but I still felt a little naked standing in a staring contest with a bear. Finally he moved to the opposite shoulder almost daring me to try going by while still maintaining eye contact with me. I released the clutch and began slowly rolling up my side of the road still maintaining eye contact. The bear didn’t move until I was opposite him then he broke contact and headed for the trees. I breathed easier and began to accelerate. He considered it but neither seemed to have enough energy left to bother with me. Finally she said she was going down to the stream and have a bath, he watched her for a moment then decided perhaps he should tag along. I watched them swaggered away. On the previous trip I came to a stop behind a Jeep with no top and watched as two tourists snapped photos of a bear standing not more than twenty feet away. I admired the confidence the woman passenger had that her driver could take off without stalling the Jeep in the event the bear decided to have a closer look. Having a bear give you the once over, makes you realize how a donut must feel watching folks stroll into the shop following their weight watchers meeting. Only on a motorcycle can you really enjoy this type of experience and believe it or not it is not unique. I seldom make this run without seeing a bear and I always see deer, moose, elk, coyotes and the occasional wolf. In Jasper I relaxed at a very comfortable B&B known as Crystal’s Cozy Accommodation before pushing on to Grande Cache and finally Grande Prairie, feeling a little sorry for the ninety-nine percent of the world that can only dream of such a trip. While riding through Alberta a couple of years ago my husband had a bear run right in front of him and stop on the painted line. There was no time to stop, so he went as close to the shoulder as he could and honked his horn. The bear turned and ran to the other side and we both went by without incident. Whew!